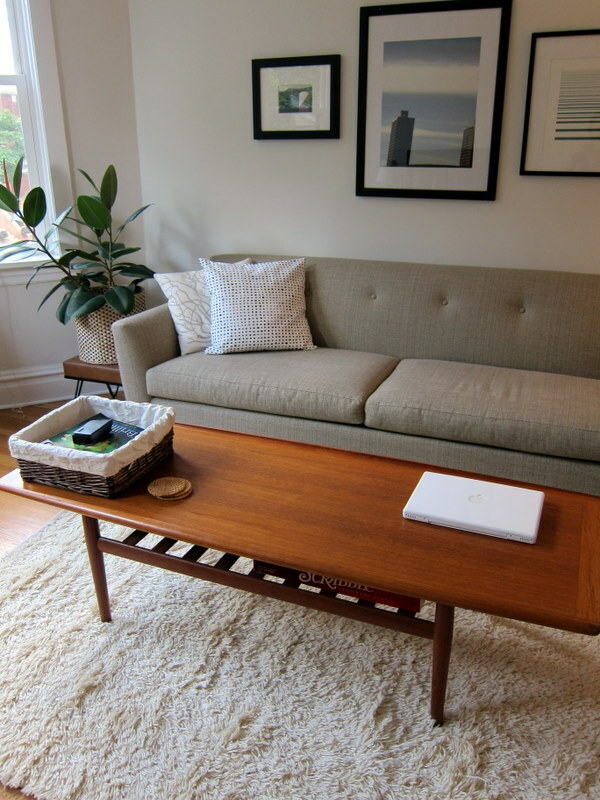 The pictures I included in the last post had me thinking that two big flat-weave rugs looked too, well, flat and what I needed instead was a low pile rug for under the dining table and a plush rug for under the coffee table. I picked up the VITTEN at IKEA this past weekend. 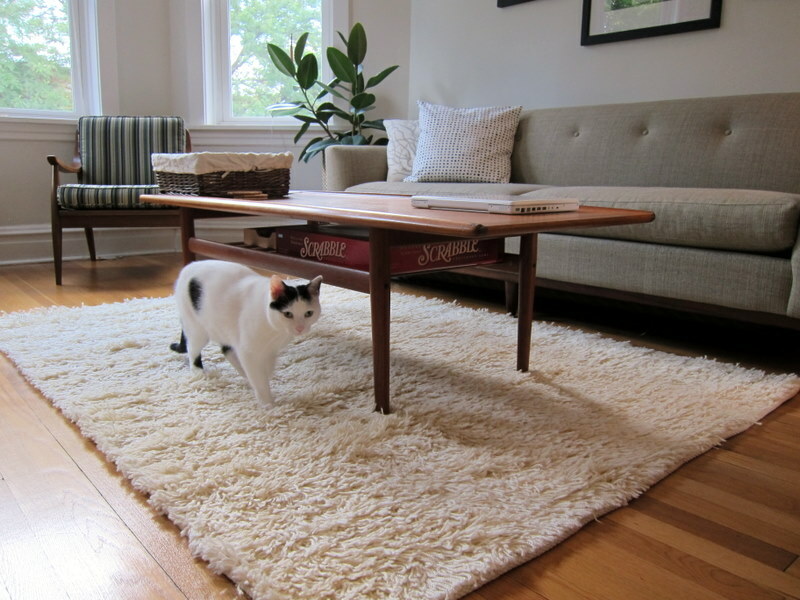 The rug pile is smushed down from being rolled up – I need to rake it. Did anyone else have to rake their grandparents’ shag carpet? (My cousins will know what I’m talking about!) 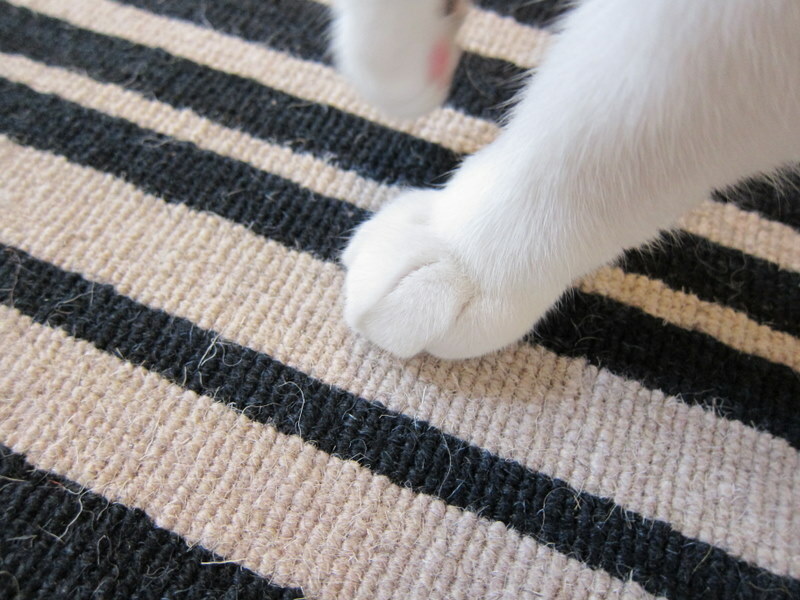 It was a satisfying chore: the carpet looked so groomed when you were finished. Doozy likes it, though. It makes him feel like a jungle cat. 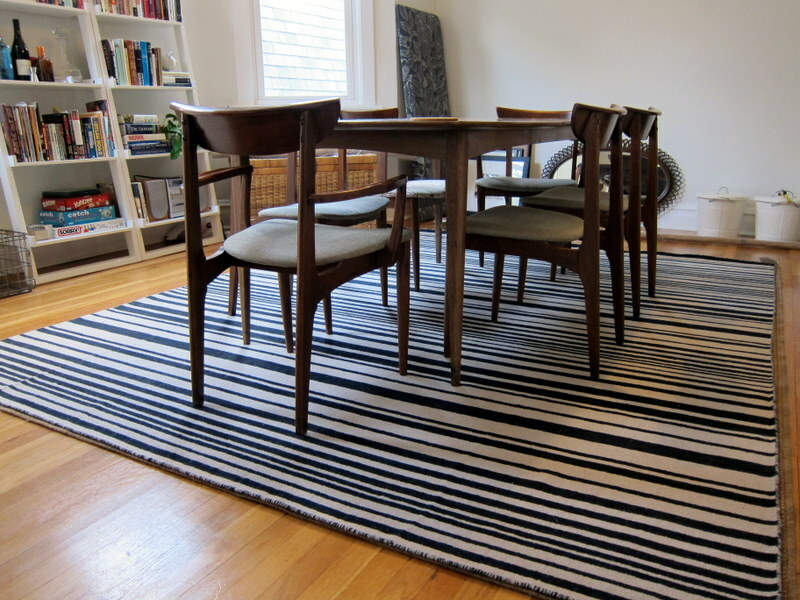 Another rug up for consideration is the Arrah Dhurry Wool Rug from Overstock.com (or O.co as they’re trying to sell us on these days). Two people have already compared it to a barcode, which certainly isn’t working in its favor. It doesn’t look quite as stark in person: the lighter stripes are a very light tan, not white, as Doozy helpfully demonstrates. 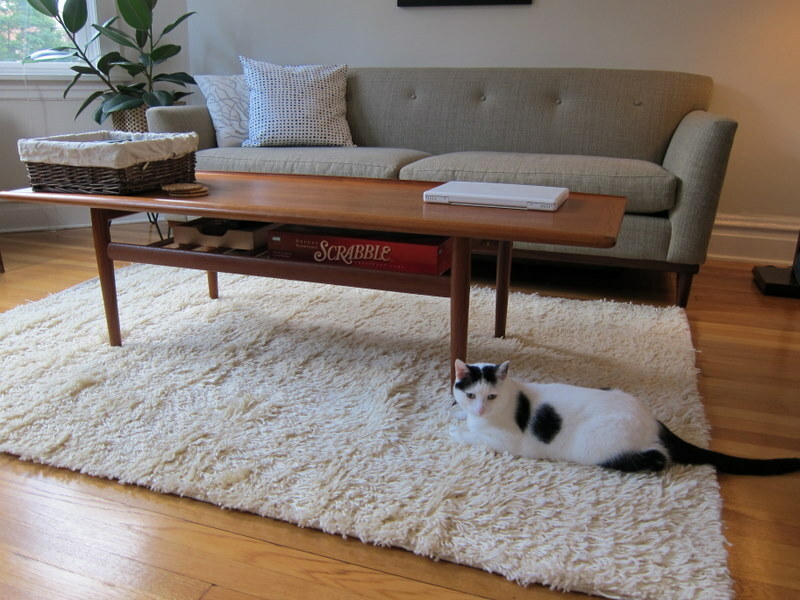 I’m very “eh” about this rug. 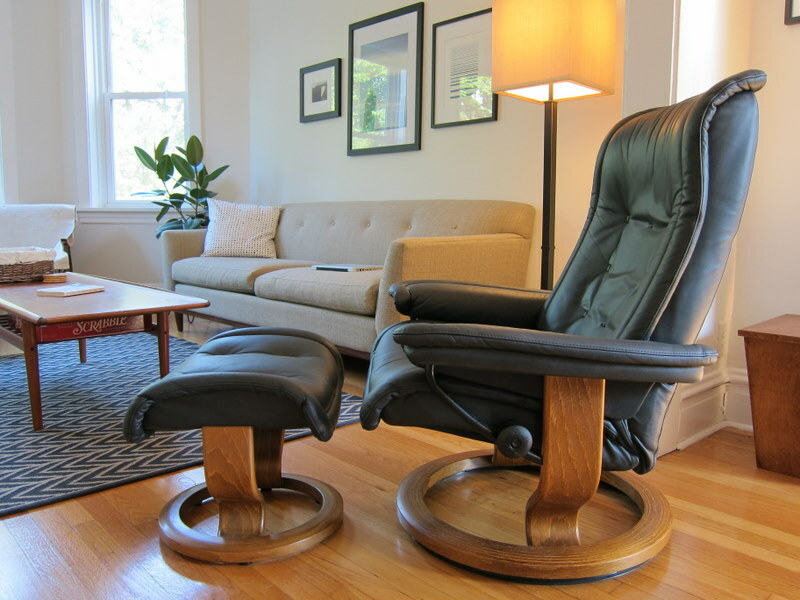 One thing I’m not “eh” about, however, is our new Ekornes Stressless recliner. 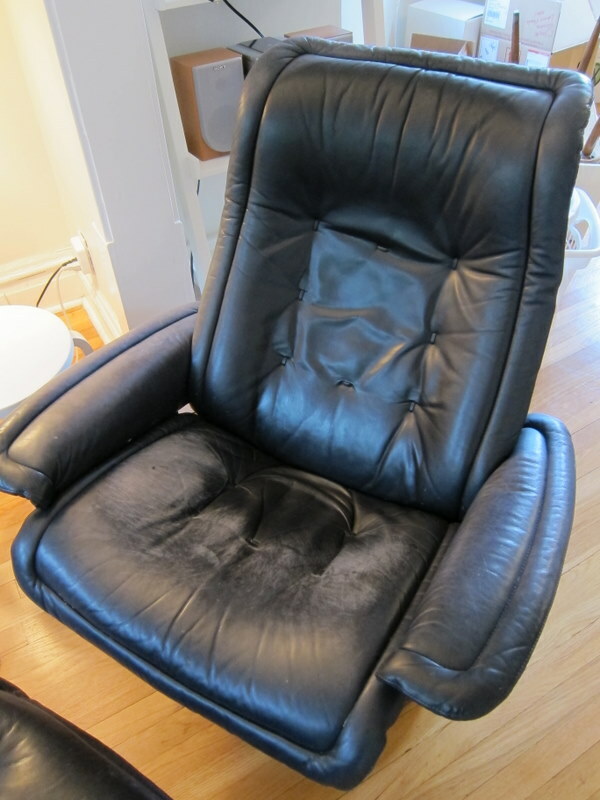 Craigslist has bestowed upon me two great finds since we moved into our new place: 1) the previously mentioned STENSTORP island, and 2) this totally awesome recliner. 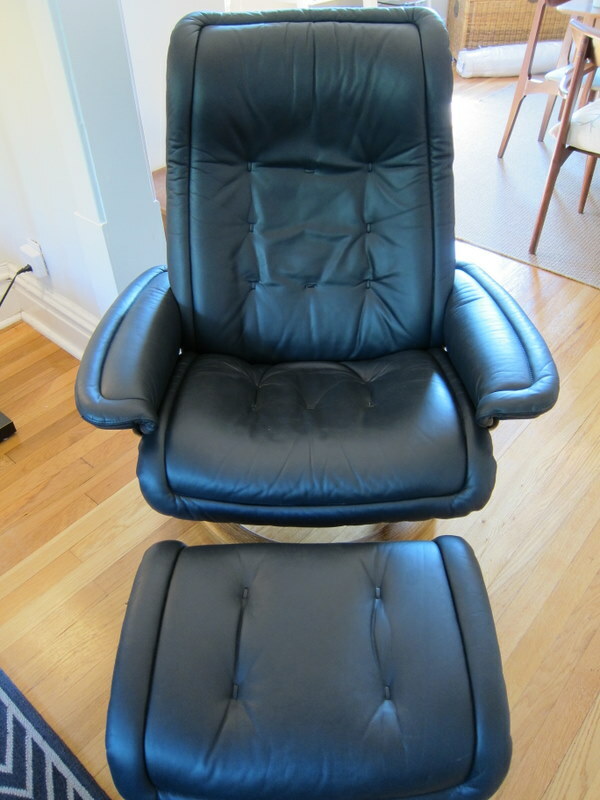 I had an alert set up for “recliner” on CL and had seen at least 700 (easily) before this chair popped up. The photo was so dark and the item was so buried amongst everything else he was selling that I almost missed it. 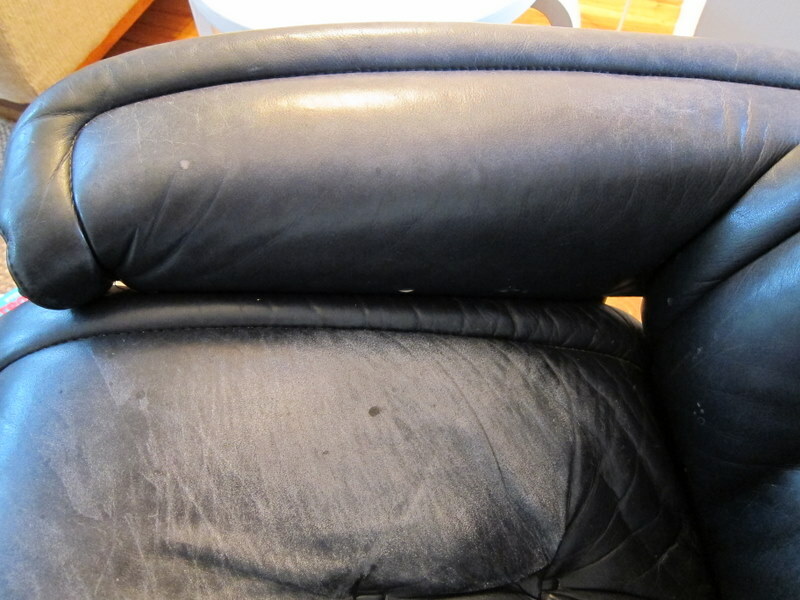 I clicked past and then realized “hey… that one might be good.” It’s so hard to find a chair that meets Jarrod’s need for comfort and my need for stuff to not be ugly (and, as we’ve seen before, nearly all recliners are hideous). 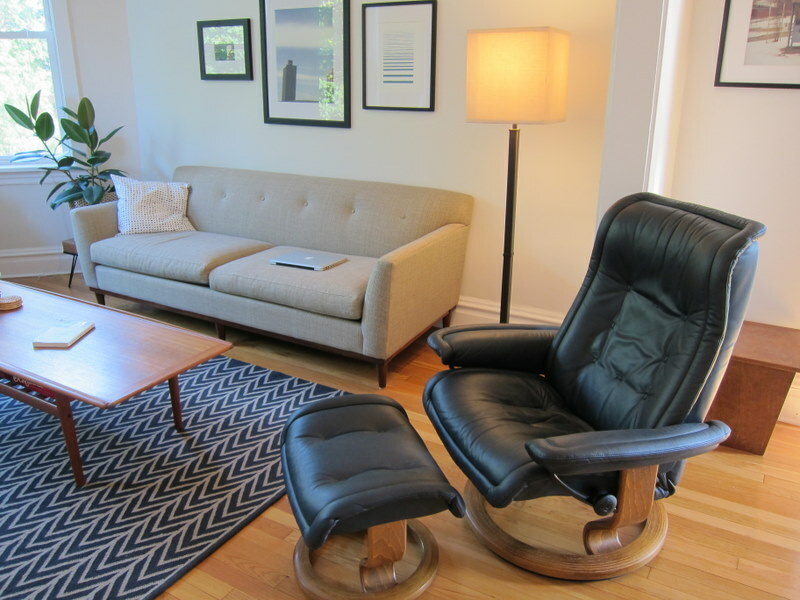 These chairs are $2,000+ new, but I scored this one for $50. 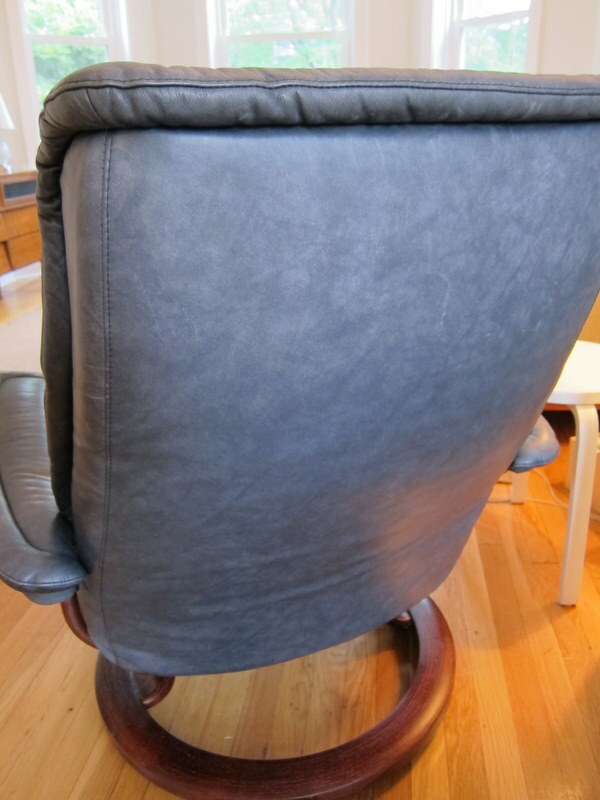 I found a woman who reconditions leather (on Craigslist, of course), who made our chair good as new and even swapped out – for free(!) – the undesirable mahogany wood base for a medium brown base. 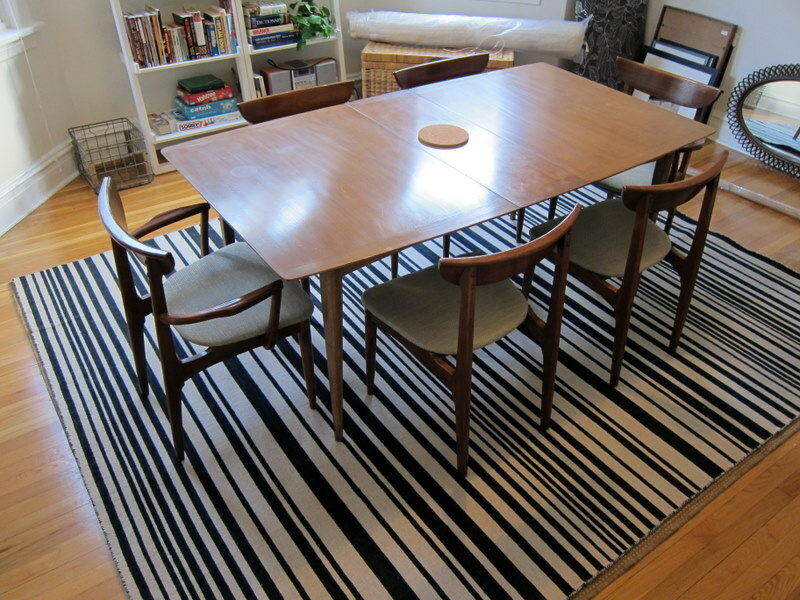 And there you see yet another rug option: the JORUN from IKEA (no longer available). I love it, but it shows cat hair like crazy despite our very regular vacuuming and furminating. Got any rug suggestions for me? I’m starting to go insane.